HAHA. So random right!? :) I know. I know. However, (what feels like a million weeks ago), I got an itch to make something for my kitchen. I didn't know what I wanted to make, but I wanted to make SOMETHING. I literally did this on a whim and don't regret it one bit. I went into my garage, saw that we had blackboard paint and a wooden board that were just filling up the garage. We made eye contact, and they said, "PLEASE DO SOMETHING WITH ME! PAH-LEASE WOMAN!" SO I did. I decided to make a chalkboard. Here is how I made it and I am sure you're thinking, "Well Shay, that's SOOO EASY!" Yes, my friends. Yes it was. It isn't rocket science. AND it wasn't the first time someone has made one of these. Original much? Heck no. With our house renovations, we had all of this laying around already - SCORE - but if you don't have this at your fingertips, these supplies are very affordable at your local hardware store! ;) Well maybe not the saw, but you know what I mean. STEP 2. Get your paint ready. 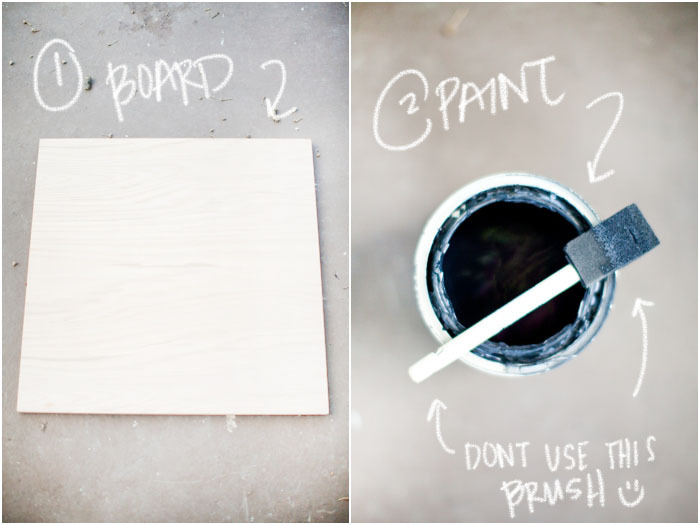 I started painting the board with this small paint brush because it was all I could find. 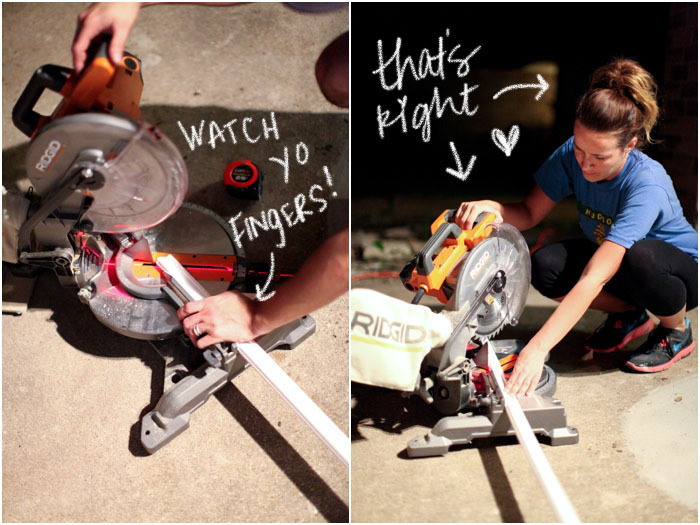 Thankfully, Drew found my roller in the garage and it proved to be a MUCH more efficient and smoother process. 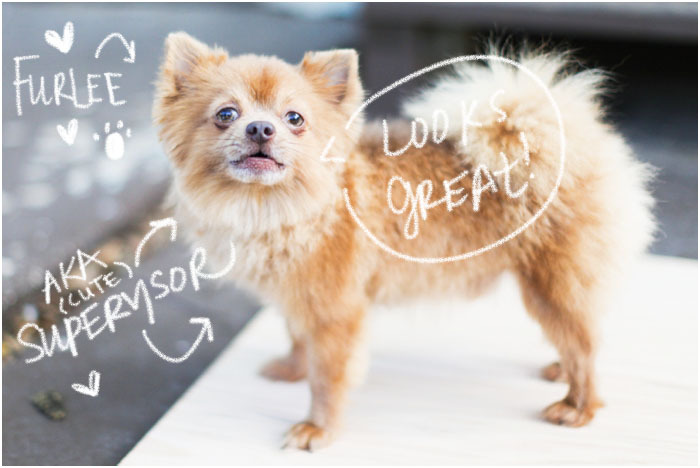 STEP 4: Make sure your Furpup approves. STEP 5: Get your trim and spray paint it white. I applied two coats. You can also do this while your board is drying too. Obviously I forgot to take photos of this part. My bad. 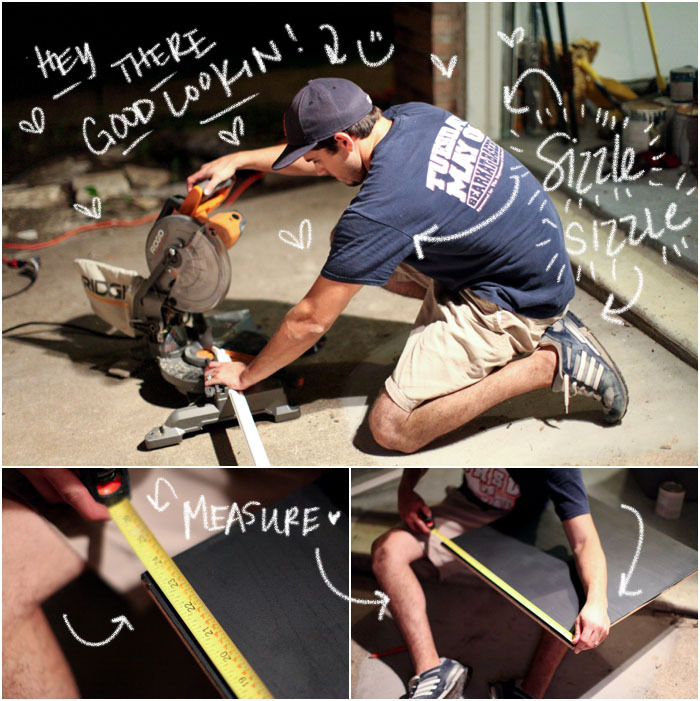 STEP 6: Measure your board to see what dimensions you need to cut for your trim. STEP 10: Drink a cup of coffee. 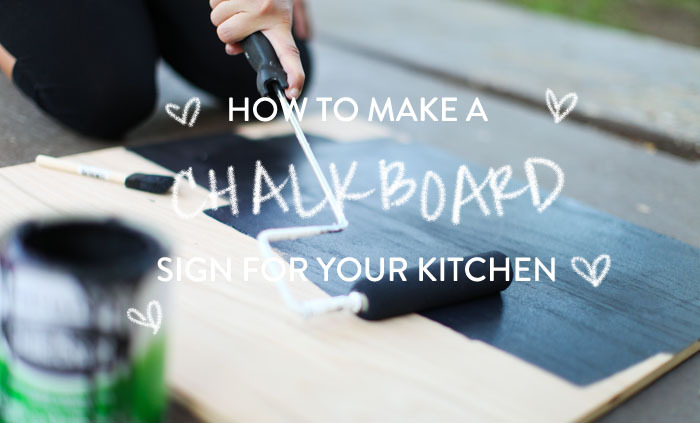 Your handwriting is PERFECT on your chalkboard!!! I love the little doodles! So cute! Y'all are the cutest. Love it muffin face!!! Thank you Amanda Pants! Love you from here to the MOON! I was wondering the same thing as Ashley ^. And you did a great job! I love it!! It looks sooo cute! Funny thing, I have some old wood frames laying around that I've saved just for making chalk boards & such! Should prob get on that!! & I looove your hand writing! Could you send some of that ability to me?? LOL! Thank you so much Carolyn!!! I can't wait for you to have your baby!!! AHHH! SO SOON! My favorite part is the writing. I'm not nearly that creative. Umm... please do more projects..cause I absolutely am in love with everything about this post haha :) The chalkboard came out FABULOUS! And I think I need your chalk writing skills ASAP. 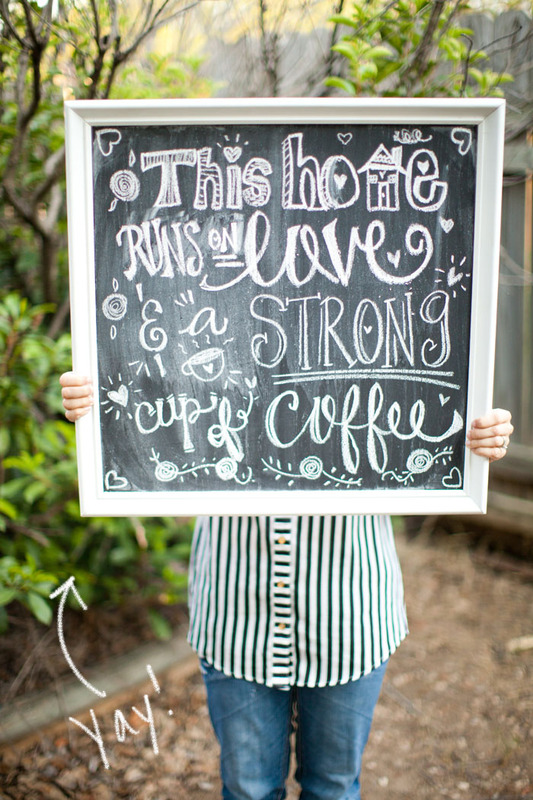 I love your cute chalkboard (and that sweet lettering) Shay! I'm definitely making one when we move to our new kitchen. Gah! That's so cute... and doesn't look TOO difficult! It wasn't at all! :) Thank you! I am so in love with what you wrote on the board! It's perfect!! You are too funny, I love the shay style tutorial, need more of these posts! and I LOVE the quote you chose for the chalkboard, I've been wanting to get a print of that quote from Etsy forever! YOUUUU are the cutest!!! :) Thank you! Love you Chels! seriously, though, you are just the cutest. i recently saw a chalkboard painted car (on pinterest..where else) and it was the coolest thing, i swear. look it up, if you haven't seen it already. Aw thanks Jess! :) I have NOT seen that yet, but I am going to go look for it now! :) LOL! That sounds awesome! yay!! i love it!! & i freaking love furlee. jesus he is adorable. 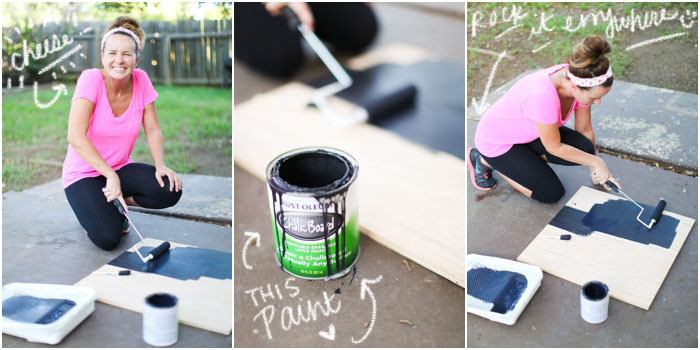 I love how you somehow turn something as simple as making a chalkboard into an awesome blog post with original content! I love your writing style and the way you edit all of your photos. You rock! Awww this is so sweet of you to say Alexa! Thank you!!! YOU rock! Aw thank you! :) You should def. make a bigger one! They are so much more fun to write on! did you try it with the chalkboard pen yet? i just bought some wood today to make chalkboards (i have the spray paint but i may have to go buy the regular paint as seen on previous comments) did the pen work properly on it?